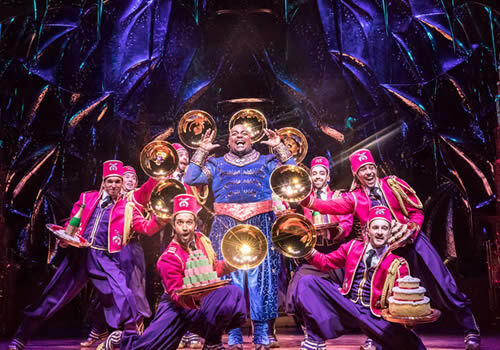 Disney’s Broadway smash-hit Aladdin plays to packed out audiences at the Prince Edward Theatre. 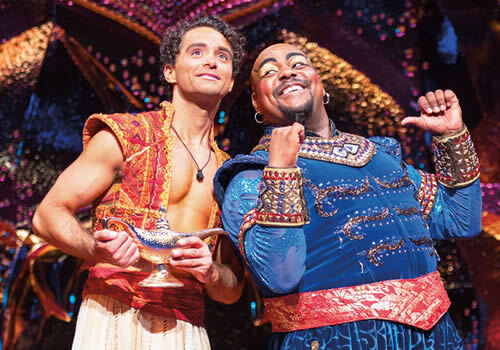 Directed and choreographed by Casey Nicholaw (Dreamgirls), Aladdin is the extravagant stage musical of the 1992 Disney film, bringing to life the vibrant Arabian Nights. Packed with well-known songs and dazzling sets and costumes, Aladdin opened in June 2016 to huge audience acclaim. 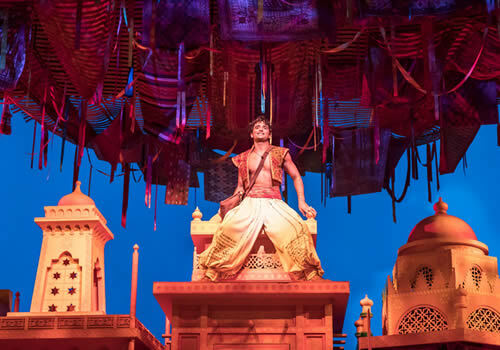 With a book and additional lyrics by Chad Begulin, Aladdin is based on the tale in 1001 Arabian Nights, following the story of a young street urchin who discovers a magic lamp and the Genie inside it. When he is granted three wishes, Aladdin has the chance to transform from urchin to Prince. After he meets and falls in love with Princess Jasmine, who can only marry a Prince, Aladdin and the Genie set out to win Jasmine’s hand in marriage. Matthew Croke (Annie Get Your Gun, Funny Girl) stars in the title role, alongside Jade Ewen (In the Heights) as Jasmine and Broadway's Trevor Dion Nicholas as Genie. Further casting includes Fred Johanson (Sunset Boulevard) as Jafar, Jermaine Woods as Iago, Irvine Iqbal (Bend It Like Beckham) as Sultan, Leon Craig as Babkak, Daniel de Bourg as Kassim and Julian Capolei as Omar. Further casting includes Koko Basigara, Robertina Bonano, Danny Becker, Angeline Bell, Bianca Cordice, Abigail Climer, Nolan Edwards, Melanie Elizabeth, Nordine Ezzahr, Antony Hewitt, Blythe Jandoo, Abigail Johnson, Travis Kerry, Dann Kharsa, Victoria Layzell, Mitch Leow, Oliver Lidert, Phil Mennell, Richard Murphy, Ian Oswald, Tarisha Rommick, Kyle Seeley, Dominic Sibanda, Ricardo Spriggs, Joshua Steel, Kevin Stephen-Jones, Kayleigh Thandani, Justin Thomas, Damien Winchester and Niko Wirachman. 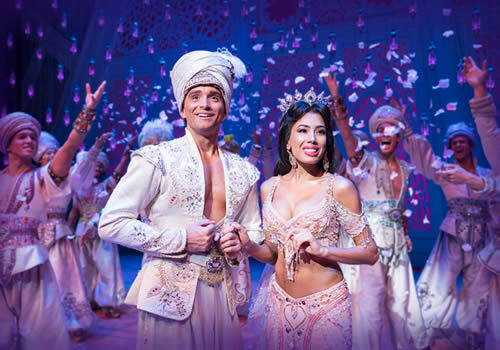 Aladdin features hit music and lyrics by Academy Award winner and Disney master Alan Menken and Howard Ashman and Tim Rice, including much-loved songs such as "One Jump Ahead", "Friend Like Me", "Prince Ali" and the Oscar and Grammy Award-winning song "A Whole New World". The production also features design by six-time Tony Award-winning Bob Crowley, lighting design by Natasha Katz, sound by Ken Travis and costume by Gregg Barnes. Don’t miss out on this spectacular show! Aladdin is recommended for ages 6 and up. Children under the age of 3 will not be admitted into the theatre. All persons aged 16 or under must be accompanied by an adult. All persons entering the theatre, regardless of age, must have a ticket. 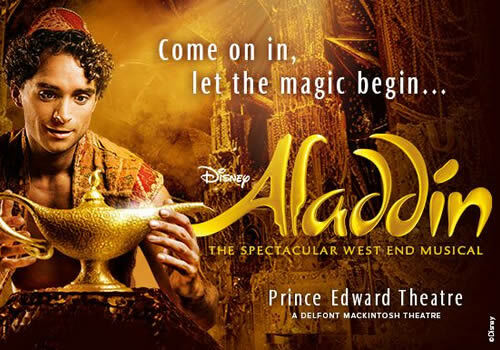 Click here for the Prince Edward Theatre seating chart and seat price guide.